Clearly has the ability to destroy himself. Silver medal as a 20 year old today. Does he look a real 20? I had the pleasure of meeting the awesome Running Monk Drummers of Sado Island Japan at the Boston Marathon in '74 or '75 .Saw them or a group like them a couple times in concert too. Kitaro has incorporated the Taiko drums in a number of his concerts. I am rooting for this guy in the 5000. BOLD PREDICTION: I am thinking he can top out at 12:46 if need be. No wonder Cheptegei was motioning for others to take the lead in the 10000. This was the top three seeds in the 5000 at WC last month in Lausanne. Ethiopians as per usual sitting on the leaders not sharing any of the work during an honest pace and steal it at the end. The only way they beat Mo is by straining him mid race. Others near his same ability need to help him. Cheptegei has the right idea and as I keep saying – one more tactical improvement and he breaks Farah. 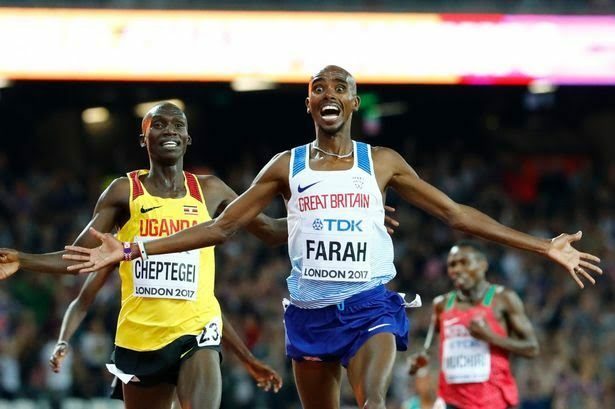 If the 5000 final takes 12:52 to win Farah will not win. Except I didnt see him in the startlist? I know he mentioned he may not run it but I didnt take it seriously. He’ll race Farah in Zurich.